it stands as a memorial to a life of work, praise and love. Imagine a flock of birds, covered with veils, beaks turned downward and wings outspread, coming together to cover the adult child of a departed parent. We are the Mourning Birds. We fly from friend to friend to support our fellow ladies who have lost a mother or father. Silently each bird, dressed in dark finery and subdued jewelry, swoops down and joins together with the other birds to show support, lend a grieving heart, to shed a tear and help say good-bye, even if we ourselves didn’t know the parent. On any other day we are ordinary Morning Birds. But when we receive the call our demeanor changes and we momentarily leave our lives behind. Then each bird joins to become one flock, individuals but now part of a whole, offering solace. No one should suffer the loss of a parent without being enveloped by the circle of outspread wings of friends. As each Mourning Bird flies away she sheds her mourning clothes and turns towards the sun and blue sky, back to her own nest, her own life, her own work; until the call comes again to join the flock and help another adult child. Each bird knows that when it is her time the Mourning Birds will raise their wings to the sky and say farewell to her too, together as one. 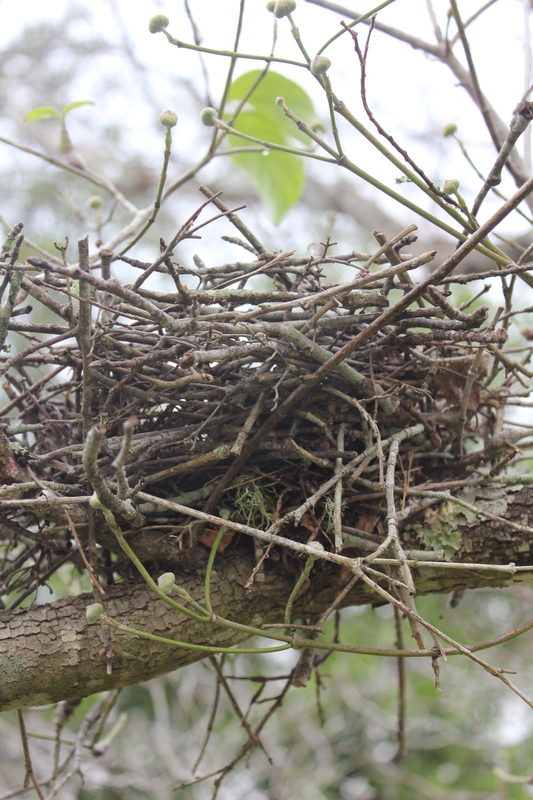 Though the parent’s nest is now empty, it stands as a memorial to a life of work, praise and love. Yesterday I attended the funeral of my friend, Marty’s, mom, who at 105 we all believed would/could/should live another decade. As I looked down the pew I saw familiar faces from my mom’s funeral service. It came to me that as we sat there solemnly we were like little birds, mourning together, enveloping one friend with our love in her moment of grief. This entry was posted in death, memories, Mom and tagged death, life changes, mourning. Bookmark the permalink. Such beautiful imagery, Claudia, such a lovely and fitting way to describe what happens at news of a death. It reminded me of the birds in the backyard who flock together to raise the young and push them out of the nest. In my imagination they flock together for a death too. Who knows, maybe they do.